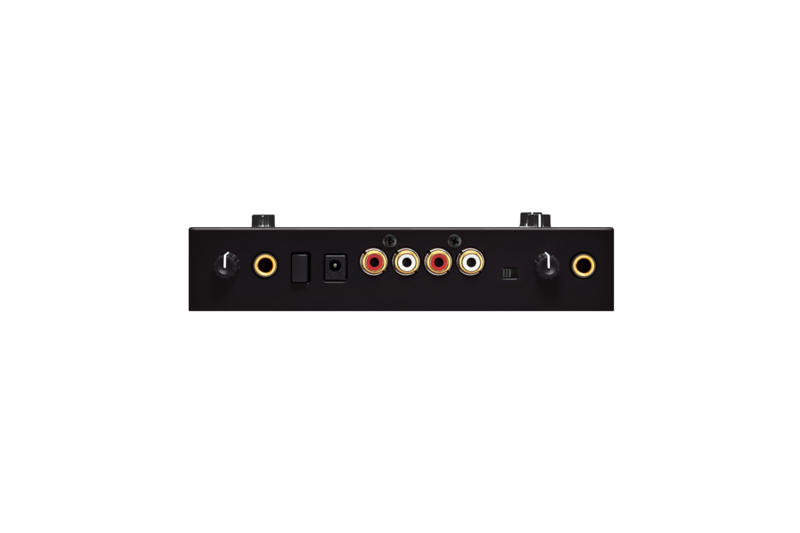 and simultaneously control up to four effects using a single fingertip! Introducing the Kaoss Pad Quad; it’s Kaoss control evolved to a whole new level. 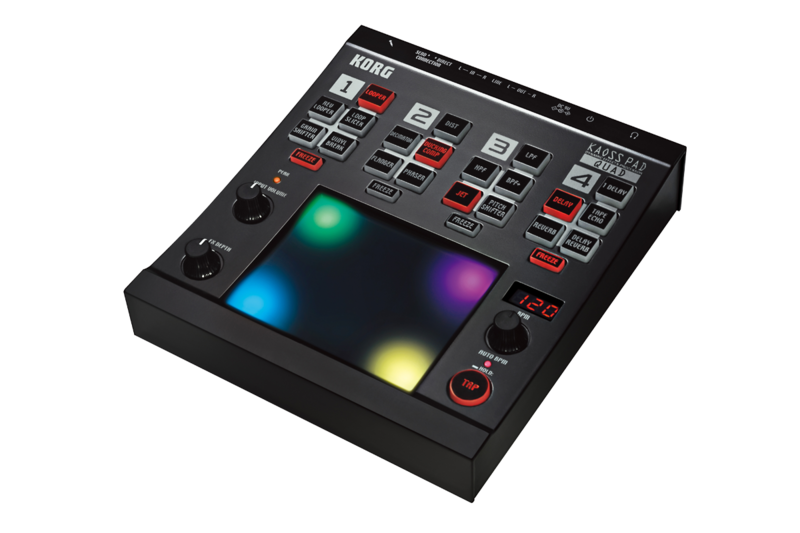 In 1998, the first-generation Kaoss Pad exploded onto the DJ/music scene with touchpad-based effect control. 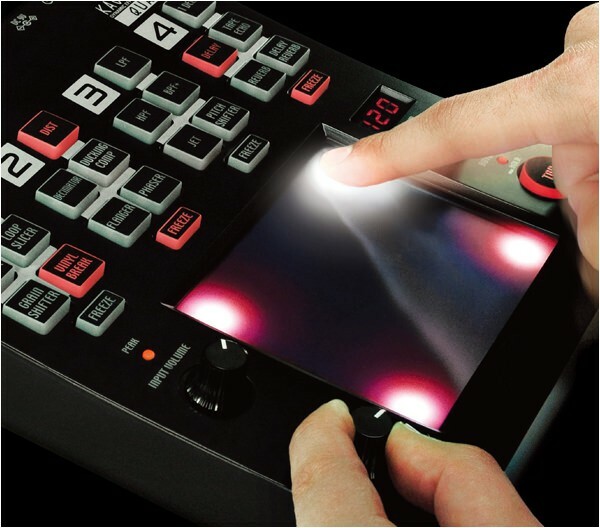 Since then, the overwhelming acceptance and popularity of the X-Y touchpad is evident in many Korg products – Kaoss Pad effects, the Kaossilator Series, our padKONTROL and nanoPAD controllers, even the exclusive M3 TouchView™ display – that are now standards in the scene. To this we add the Kaoss Pad Quad, with new effects, functions, and features. Choose one of five effects from each of four effect groups; a total of 1,295 combinations! 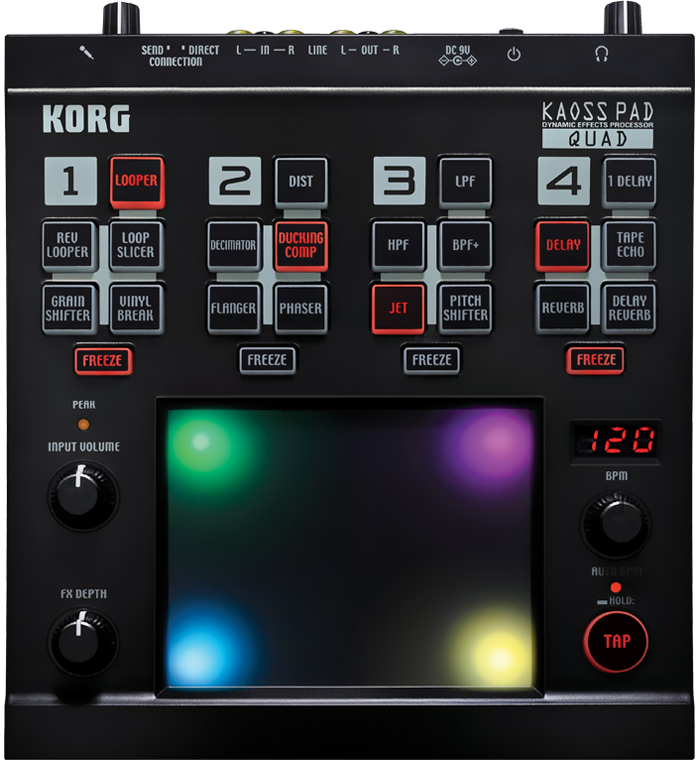 The intuitive interface that has helped to make the Korg’s Kaoss Series so popular is alive and well on the Kaoss Pad Quad. 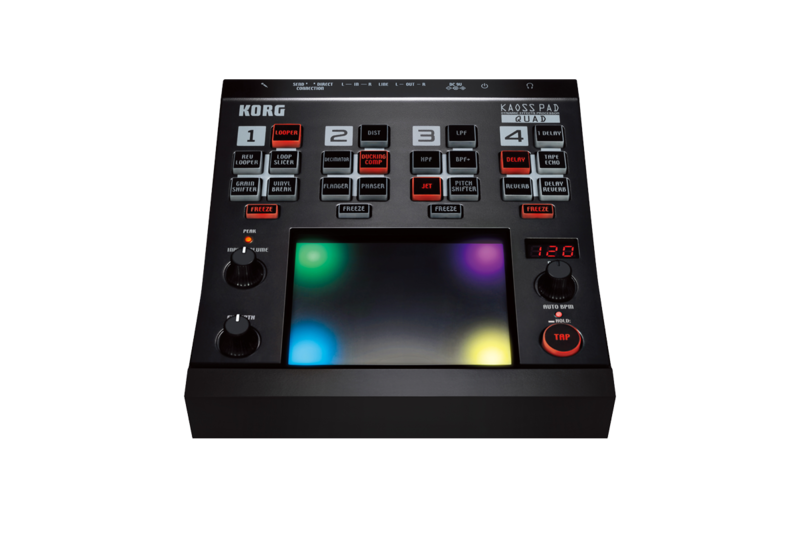 As you tap, slide, or move your finger across the X-Y touchpad, the effect parameters will change, producing dramatic realtime changes in the sound. One big change to the touchpad is brilliant LEDs that light up in an intense variety of colors. The illumination changes depending on the state of the effects, the BPM setting, and on your movements while performing. The DJ booth or stage will be brilliantly illuminated, visually boosting the excitement level! 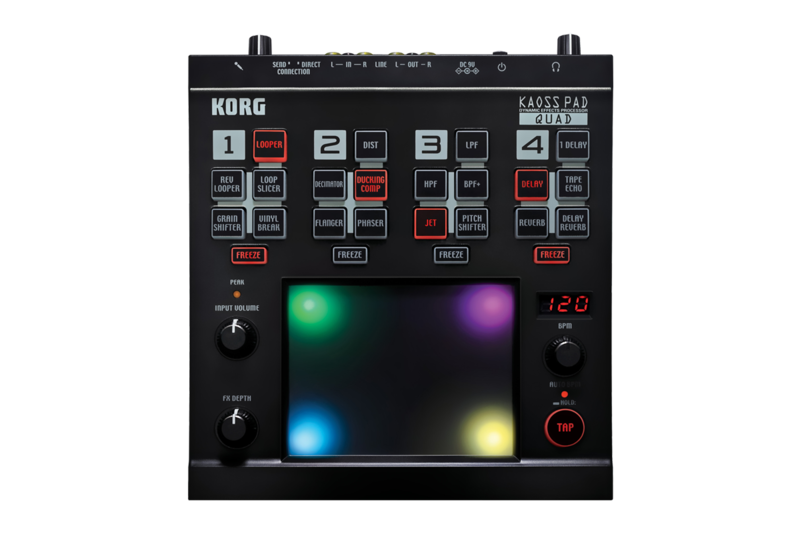 As the name suggests, Kaoss Pad Quad lets you simultaneously control up to four effects from the touchpad. Each of the four effect categories – Looper; Modulation; Filter; and Delay/Reverb – contains five options (plus a null, or off position), for a total of 1,295 combinations! Best of all, effects can be chosen directly from the front panel, which means that you customize your effect needs on the fly. Enjoy trying your own Kaoss combinations and discovering ways to radically morph the sound. 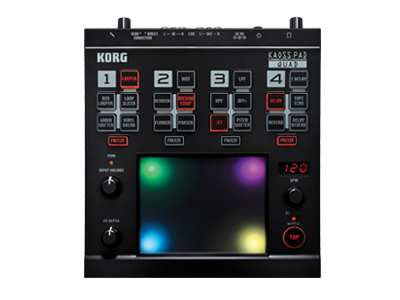 By rhythmically adding successive effects, or switching effects on and off as your song progresses, you can use the Kaoss Pad Quad to add variation and development to the structure of your song. In other words, even a simple beat can be transformed into a lush musical statement. Kaoss Pad Quad is extremely straightforward and easy to use, making it an enormous asset to the professional and great fun for the casual user alike. Just touch the pad to apply your chosen effects combinations. Connect a portable audio player or any audio source, and begin enjoying hours of sound creation and manipulation. Freeze button offers hands-free effects! For each of the four effect modules, there’s a Freeze button that memorizes the position at which you’re touching the touchpad, causing that effect to be held even after you release your finger. If you touch the touchpad again while Freeze is enabled, only the“unfrozen” effects will be controlled. You can achieve even higher levels of performance freedom by using the four Freeze buttons in conjunction with the effect type buttons. Use the touchpad to loop part of your song; the number of beats is controlled by the location you touched. Three types of looping are provided; the standard Looper; the Rev Looper (Reverse Looper) which plays the looped phrase backward; and the Loop Slicer, which divides the phrase and lets you loop-play only a specific portion. You can switch between the different looper types by sliding your finger up and down the touchpad as the loop plays, producing radical new beats on a whim. Using these sophisticated loop tools makes it easy to ignite a frenzy on the dance floor. The first effect lets you slide your finger up and down on the touchpad to simulate the scratch sounds that can be produced on a turntable. Next, if you leave your finger on the touchpad without moving it, you can also create the effect of gradually slowing the playback speed to a stop, just as when you stop the rotation of a turntable. This realistic sound is highly usable as part of a DJ performance, allowing even a beginner to feel like an experienced DJ. This creates the distinctive “ducking compressor” effects that have become a staple in music production. By boosting the sound level during off-beats of the kick drum, this effect can expressively transform your sound in very musical ways. The proprietary Auto BPM engine automatically detects the tempo/BPM (Beats Per Minute) of the song that’s playing or the audio source. Using this function allows BPM effects such as delay to remain in sync with the song. Tap Tempo is also provided; you can press the TAP button several times at the desired tempo to set the appropriate BPM value even for a song that does not have a strong rhythmic feel or whose BPM is difficult to detect. You can also use the BPM knob to make fine adjustments.